Adam Elsheimer(1578–1610) was a quite influential artist of his time but his repute for “ingenious fancy and precious finish” led to being unable to finish enough pieces to actually make a living. Elsheimer, despite having a talent that inspired Rembrandt and Peter Paul Rubens, died in debtors prison. Elsheimer was born in Germany. He left Frankfurt, traveled to Venice and arrived in Rome in 1600. Although admired by his fellow artists for his talents, no art patron would give Elsheimer a commission. He would remain in Rome until his death. 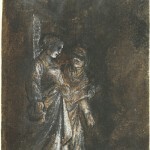 Elsheimer's widow would try to sell his work The Flight into Egypt for 300 crowns. There's some evidence that Peter Paul Rubens (1577-1640) lamented his fellow artist's death and that a lack of finances prevented him from buying the painting for himself. It would become Elsheimer's most famous work, despite the fact that he couldn't sell it during his own lifetime. Some correspondence of the time identifies Dutch Count Hendrick Goudt (1582-1648) as the buyer of the painting. 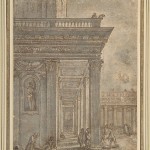 At least one historian portrays Goudt as having contributed to Elsheimer's financial woes. Another identifies the landscape painter as a dear friend. 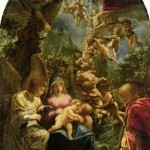 Goudt turned The Flight into Egypt and several other Elsheimer works into prints that he sold after the Elsheimer's death. It's believed that Elsheimer had married and had several children based, in part, by his pen and ink drawing, Destitute Artist with his Family, completed in 1605. An artists dictionary from 1849 provided a list of students which would indicate that Elsheimer influenced a number of young artists. Unfortunately, other than being mentioned within that text, I can find virtually no information about them or their art. 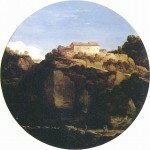 The exception is David Teniers, the Elder (1582 – 1649) who would be the first of three generations of Teniers painters. Pieter Lastman (1583-1633), who was Rembrandt's teacher for six months, admired Elsheimer's work. 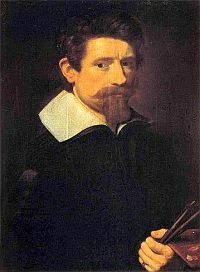 Some art scholars believe Lastman took his inspiration for his rich costumes, Romanesque buildings and human expressions from Elsheimer which were in turn a source of inspiration for the younger Rembrandt. A word of caution for anyone studying Adam Elsheimer…it would appear that the available works actually completed by Elsheimer and have survived history are somewhat limited. Many of my searches for paintings done by the artist returned engravings and paintings by Wenzel Hollar (1607-1677) and other later artists who simply worked in what is defined as “the style of Elsheimer”. 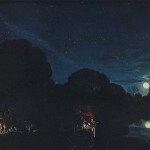 I also saw where historians had once attributed works to Elsheimer and have since re-identified the artist as a “follower of Elsheimer” which to my mind would indicate that his works are somewhat difficult to assign as having come from his own hand.